Not all shredders are made equally. Here are the criteria you should consider when trying to find the best paper shredder for use in your home. If you get a lot of papers that have personally identifiable information on them on a regular basis, and also don't like to accumulate paper clutter, it can be a really good idea to get a paper shredder for use in your home. Paper shredders are quite helpful for reducing the risk of identity theft, and also provide peace of mind as you declutter excess paper from your home. Many people have felt disappointed though when they've purchased a shredder, because it was harder to use than anticipated, or didn't work well. That can be frustrating. Therefore, before you go shopping for a new paper shredder here are the criteria you need to consider in whatever model you're looking at, to get the best paper shredder for your home that you can. Paper shredders cut the paper up in a variety of ways. The classic type of cut was the long strips of paper, but over time people have found that these don't provide as much security for documents which can often be easily pieced back together with this cut. The smaller the cut, and the more pieces the paper is cut into, the better for your privacy and security. Therefore, if you can get a shredder that cross cuts, or cuts the paper into diamond shapes (called diamond cut). While we want our shredders to cut a reasonable amount of paper at a time we don't want anything or anyone else to get harmed by the sharp blades. Safety concerns with shredders should be on everyone's mind, but especially if you've got a home with small children or pets. You definitely don't want little fingers anywhere near sharp blades! When my kids were much younger we kept our shredder unplugged and only plugged it in when we needed to use it, because of safety concerns. However, you can also look for a shredder with safety sensors that shut off automatically if hands or fingers get too close or come into contact with the input part of the shredder. From a practical perspective it's important to note how many sheets of paper your paper shredder can handle shredding at a time when deciding which one to get. The term you're looking for is "feed capacity," and typically the higher the feed capacity the more expensive it is. Feed capacity is typically listed as the number of sheets it will accept and shred, without jamming, at once. 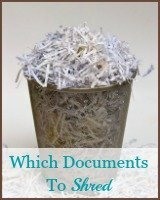 If you shred regularly, as I suggest in my article about maintaining your shredding pile, shredding just a few pages at a time won't be a big deal. However, if you have a huge stack to shred being able to feed lots more pages at a time, say 8-10, compared to 3-5, can make a huge difference in how long it takes you to get the whole thing done. Plus, knowing your own patience level will help too, because one of the easiest ways to jam a paper shredder is to try to put too many pages in to shred at once. The larger the feed capacity the more expensive the machine, typically, but if you have already jammed several machines from trying to put in too much at once know yourself. A helpful hint I've learned with research and doing a lot of shredding is that shredders also work best if you do one to two sheets less than the max they say is possible. In practice this means that if your shredder, for example, says it will shred 8 pages at a time it typically will, but it will actually work better if you put in a max of 6 at a time. 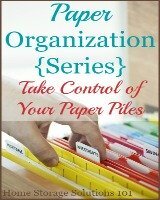 Along with considering how many sheets of paper it can shred at once, you also need to consider how much paper it can shred in one session before it needs to rest. This information is often harder to find, but reading reviews will often help you find the best paper shredder for you by helping you get a realistic sense of how much the machine you choose can handle before it needs a break for the day. 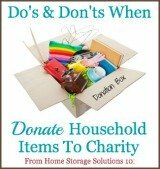 Another practical concern is to consider several aspects of emptying your shredder. You should consider how often you'll need to empty it, how you can tell when it's full, and finally how you remove the shredded paper from the bin. If you plan on shredding a fair amount at a time you want a bin that holds a lot of paper in it (remember that as paper is shredded it takes up more room than the stack itself), so you don't have to empty it too often. Further, a see through bin is a huge plus because it allows you to watch and guage when the bin is getting full. That helps you not overflow the bin (which can also cause a jam in your machine) or have to check it too frequently since you're guessing. Some shredders have a sensor to tell you when the bin is full, which can also work well. Finally, the method of removing the shredded paper from the bin is important. I do not prefer the shredders that you have to lift the heavy top, with the shredding mechanism in it, to remove the shredded paper. It makes a mess, dropping little bits of paper everywhere that you have to clean up, and is cumbersome. A better type of removal system are bins that slide in and out so there is less mess. Another criteria to consider when trying to find the best paper shredder for you is what types of objects the machine can shred. Obviously it is primarily designed to shred paper, but there may be other things you will need to shred. 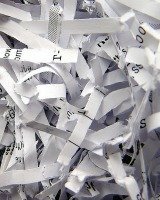 If you have a lot of staples or light paper clips in the paperwork you want to shred you'll save yourself quite a bit of time and hassle if your machine is designed to deal with these items, otherwise you have to painstakingly remove all those staples and hope you don't miss small clips. In addition I find it helpful to have a machine that can shred credit cards, and possibly even CDs. If these are regular needs for you as well make sure to get a machine up to the job. Finally, like any machine that gets a fair amount of use, periodically your shredder will need some maintenance. 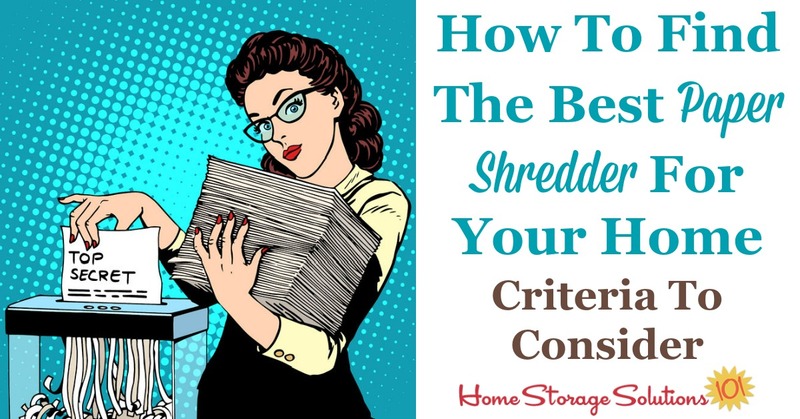 Choosing a personal shredder that is simple to maintain, doesn't jam easily, and doesn't burn out or overheat easily, will help make your life simpler. Reading reviews will help you know which machines have been working well, for a reasonable time. In addition, you may want to choose a machine that has an automatic cleaning cycle which will stop paper build up within the shredding mechanism. Finally, if your machine manual suggests it, you should regularly add paper shredder oil for the blades, to keep them working their best, or periodically run shredder sharpening and lubricating sheets through the machine.